I lived in the Philippines, and now am back in the U.S. (near Omaha, NE). 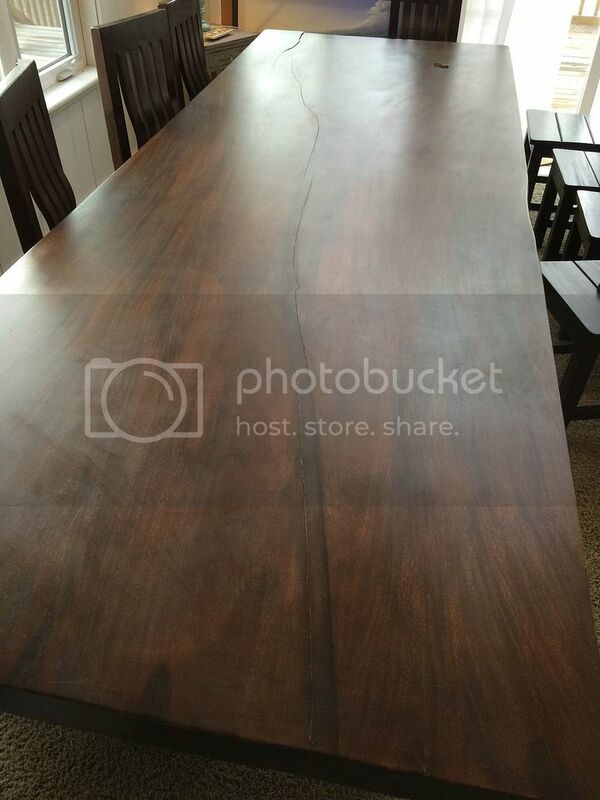 Before leaving, I purchased a huge 132”x34”x3” Acacia wood table (I don’t know which type of Acacia. It’s very common in the Philippines.) Unfortunately, the two teenagers that were tasked with moving this monster of a table into my home dropped it and it cracked from corner to corner. 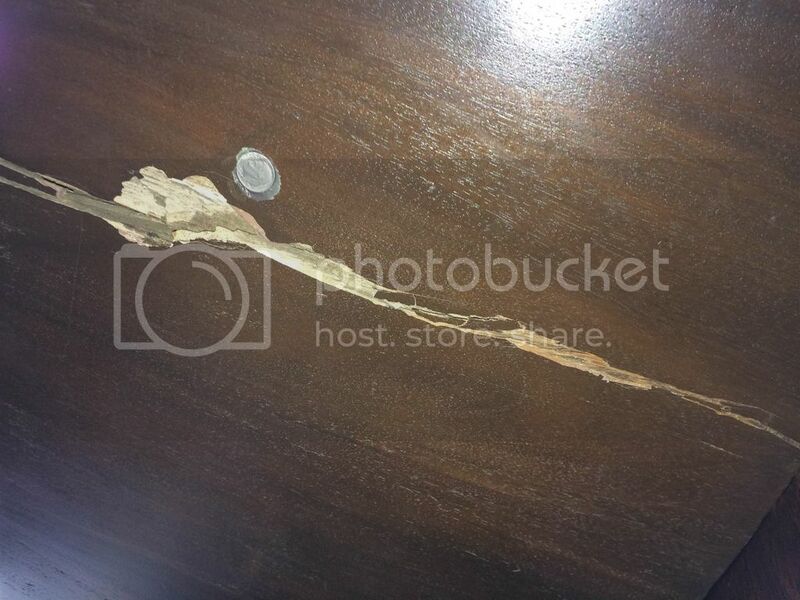 Insurance is going to pay for a new table, but I’m planning to have this one fixed instead. Since I have the opportunity to have the table fixed with insurance money, I could use it to allay some of my fears about the moisture of the wood. The wood was air-dried outdoor in the Philippines. Some basic research tells me that equilibrium air content in the Philippines, island of Luzon, is 18-19%. Omaha has an equilibrium air content of 12-14%, and I don’t believe that takes into account HVAC. 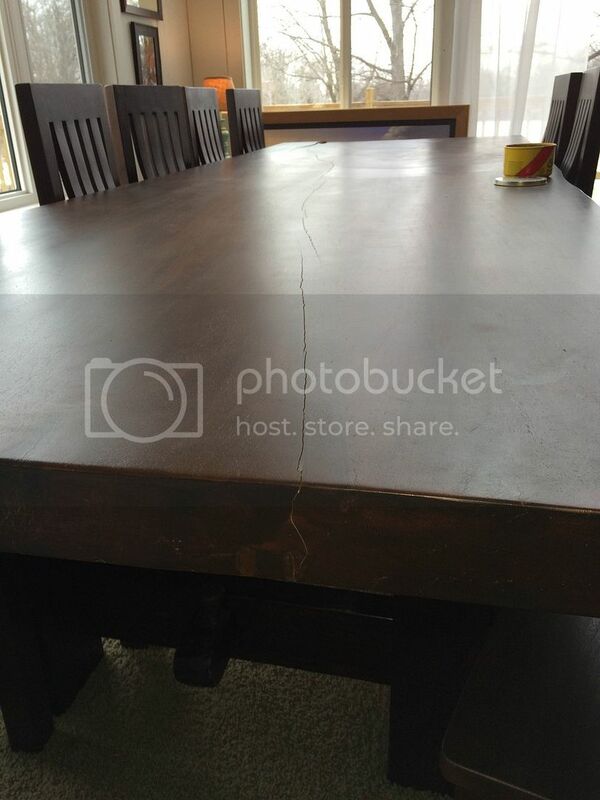 Should I have the table fixed now, or live with the crack for the next couple years until the equilibrium is reached and then have it refinished? I don’t want to do it twice. I ordered a wood moisture meter and should have measurements this weekend to know what I’m dealing with. Both sides of the table are finished and waxed, but I don’t know with what they were finished. Bottom line, with the information above, how much distortion/discoloration can I expect? Thanks for your assistance! In one pic the slab looks solid.In another it looks like a thick veneer of Acacia over something of the who know variety.What a shame. you could get a moisture meter and check it to see what the moisture content is. but it looks like it would be a remotely simple fix. The table and chairs are beautiful; I see why you want to repair the table top. Unfortunately, I cannot see how the top could ever be repaired and come even close to the original beauty. I have to believe an invisible repair, even for the most skilled craftsman, would be tough. I suspect that the cracks will always be seen. If you are committed to repairing the top, the first step I would think is develop a plan to repair the cracks. That may guide the decision on whether to wait or to proceed with the repair now. Since the top is finished, the raw exposed wood on the edges of the cracks may take and give up moisture differently than the intact areas. This could result in shrinking or swelling around the cracks while the rest of the top remains mostly unaffected. 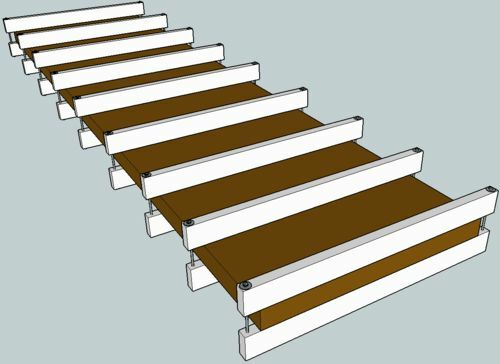 If this happens, getting the top back to flat could require removing wood at least around the cracks, requiring either a perfect finish match or refinishing the entire top. If the top is a veneer of Acacia, the veneer could be removed during the surface prep and ruin the top. An alternative is to make a new Acacia wood top. Using sample boards, the finish could probably be matched fairly well – at least so that any mismatch with the chairs and the table legs would go unnoticed. Thanks for your response! The top is solid Acacia, without Veneer; however I’ve been informed that in the Philippines, it’s common to call “Monkeypod” by the name “Acacia”, although they are two separate species. So it may be solid monkeypod; I can’t say for sure. I purchased a moisture meter and will have measurements this weekend. Here is the advice I got from a furniture maker. It would be great to get some additional opinions, though I like his style. 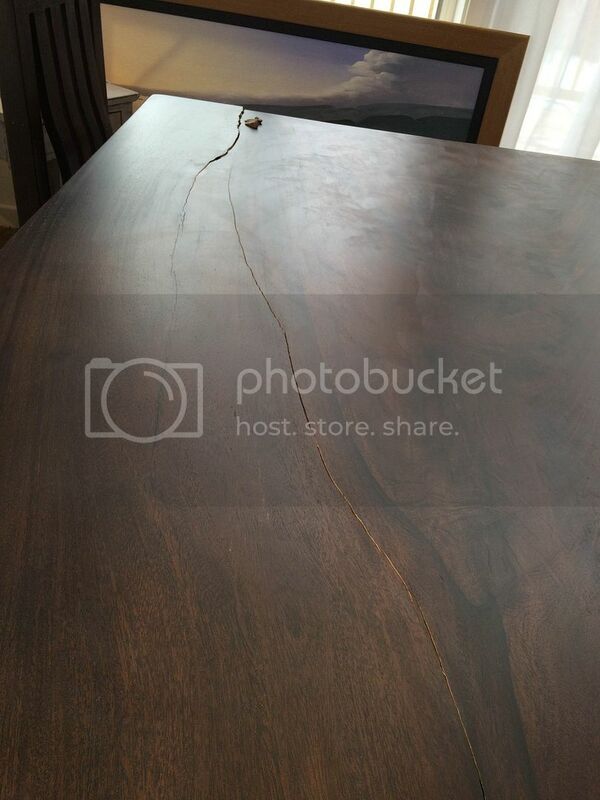 “In the first picture, see how the split follows that black grain line down the length of the table? Judging from the fact that the split seems to follow the grain, I think this happened basically due to instability in the wood itself. I’m sure the radical change in environment (temp + humidity) had a role, and dropping it was just the final straw. I don’t recommend forcing it completely apart and re-gluing it. It will be near impossible to get the seam to work. I would try to put some clamps on it first and see if it will close up and how well it will close up. If it works well you could use the glue in a syringe. I like the use of bow ties but i would also like to see a stripe of contrasting wood down the crack,kind of like the cutting boards with the wavy line in them. I know most wouldnt like it but i like different things like that, my kitchen table is mahogany with white maple stripes and all the pieces cut like subway tiles. So my tastes are a bit different. In my opinion, short of painting it you will not be able to hide that humongous crack. Sometimes when you have a huge problem that you can’t really fix, making it a feature is the best approach. I would think about filling the crack with epoxy, perhaps colored or tinted. Emphasizing the crack and making it attractive at the same time. Then refinishing the entire top. Just a thought. The problem with using a moisture meter is that the outside may seem perfectly dry while the interior is still significantly damp. To be safe, give it at least a full year before having repairs done. I would consider butterflies from below but I’m personally not a fan of having them stuck on the face of a solid slab like that as I find it visually jarring. My recommendation is to identify a close match in wood species then use a combination of wood wedges that match surrounding wood, tinted epoxies and pigments to blend the crack in. Then the entire top will need refinishing. Such a repair won’t be totally invisible (they never are). However, a skilled artisan can get the colors close enough that it won’t be apparent to anyone that’s not looking for it. Perhaps make one of these. River table. Most of the crack is straightforward to fill and sand with the correct color filler, it will show like a dark line and only you would be able to tell that it is not the natural wood. However there are two areas that are of concern. The crack is likely to get wider as the wood dries and if it is located in a air conditioned environment, should reach around 8% moisture eventually. No means can stabilise the wood until it reaches equilibrium moisture so it would be wise to leave it to dry an extra year indoors and unfinished before repairs. The other concern is that the wood seems te be distorting and lifting making it difficult to bring it even and again, this wood movement needs to stabilise before attempting repairs. My recipe would then be to remove the legs and apron and strip the finish and let it sit in a dry environment for a year. Then mix some thick epoxy with the color pigment of your choice, could be carbon black, fine wood dust or whatever gives the wanted color through trial and error and fill the cracks leaving a supplement of filler above the surface, this can take more than one application. Once dry, take the top to a mill that owns a 36’’ timesaver sanding machine and run it down until you get a perfectly flat surface. I buy my epoxy by the 1-1/2 gallon containers (2-1 mix) and love the versatility I have using it. I’ve done ornaments that have huge cracks, then filled them with clear. I have to point the cracks out to people. For the heck of it, I’m mixing coffee grounds and filling a few cracks to see how well it sands and polishes. I suspect it will go well, and that approach would work for you. the color would be hard to find. Do some experimenting with something else and see what you think. 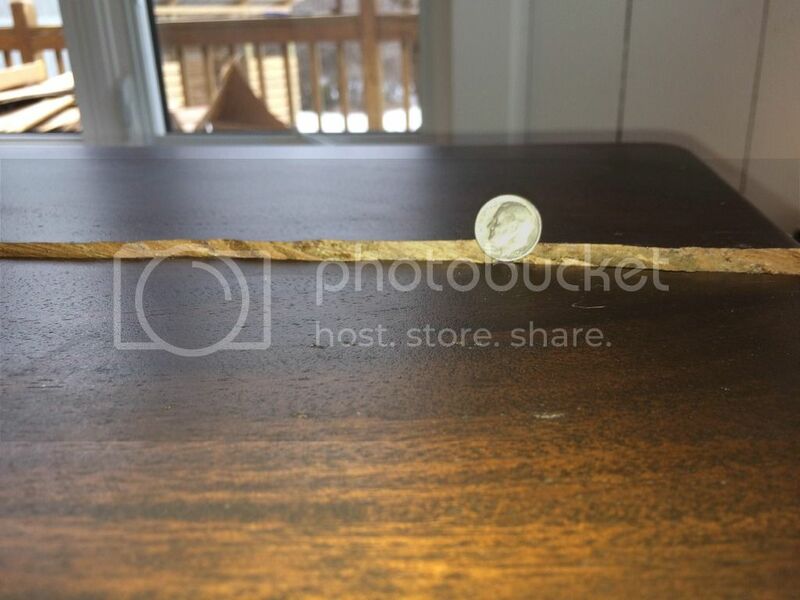 I’m a great fan of stabilizing wood as best I can. I’m experimenting with pine pitch and turpentine (with boiled linseed oil/tung oil) right now. For exterior, that’s all I’ll use for the experiment (a bench, which gets dumped on by a gutter). For interior, a surface coat would see moisture in/out and serve as another line of defense. It always bugs me that even so called experts don’t treat the interior of chests and such. Some even defended the practice and argued against it. Why? Anything that slows gain and loss of moisture in wood is going to stabilize it, to some degree, against shifting (expanding and contracting), and minimize the kill potential when you move it from England to the deserts of Eastern Washington, or the equivalent or opposite. Once dry, take the top to a mill that owns a 36 timesaver sanding machine and run it down until you get a perfectly flat surface. When strip sanding, leave the finish on the ends, to keep the end grain from drying out too fast. Then clamp it between cauls to keep it flat as it dries. 2×4s (slightly crowned, to allow then to apply even pressure pressure along their lengths) and 1/4” bolts or Allthread long enough to pass through the 2×4s, the gap in between, and have enough for washers and nuts. Probably about 12” total length. A woodturner would tell you that is a great design oportunity. “In the first picture, see how the split follows that black grain line down the length of the table? Judging from the fact that the split seems to follow the grain, I think this happened basically due to instability in the wood itself. I m sure the radical change in environment (temp + humidity) had a role, and dropping it was just the final straw. I don t recommend forcing it completely apart and re-gluing it. It will be near impossible to get the seam to work. I pretty much agree with him, but would want to wait through another winter to see what the dry air in the winter will do to it. First and foremost – this stinks! Second – I’m also from Omaha, and I’d recommend connecting with another member on this site, Dennis Zongker. He’s a super talented local maker in Omaha, and he may be able to help you out and guide you in the right direction. He may even be willing to come and see the table in person and make some recommendations based on what he sees. Hopefully you can get it sorted out! It looks like a beautiful table, and I’m sure the sentimental value is just as, if not more, important.